Norwegians played a big role in the history of skiing in Minnesota, forming ski clubs, organzing jumping competitions, and ski running with style. Pete Fosseide was one of those inspirational Norwegians who left a legacy, which still lives in Duluth, Minnesota. If you spend any time talking to George Hovland from Snowflake Nordic Center in Duluth, Fosseide's name will probably come up. Hovland still has a pair of skis used by Pete, who was 20 years older than George. "By the time Fosseide got to St. Paul, the groove on the bottom of the ski was no longer there below the foot" said Hovland. George was referring to Fosseide's incredible 247km trek from Duluth to St. Paul for the 1938 Saint Paul Winter Carnival. Peter Fosseide, who was born in Rindahl, Norway, competed with 14 other skiers in the Arrowhead Ski Derby, an event to celebrate the St. Paul Winter Carnival. The winner would receive $150 in merchandise ($2230 in 2008 dollars) from a $300 total purse. Several skiers from St. Paul traveled to Duluth to join Fosseide and others in the five-day endurance event. The temperature was cold at Friday noon on January 28, 1938, when the 15 skiers departed from the courthouse in Duluth. Fosseide, who was 31 years old at the time, led after the first leg to Carlton, MN, a distance of 32km. There were no trails to ski on at that time, so Fosseide and others had to travel on the sides of roads and walkways, across fields, and through whatever terrain they could find to make their way to the next town. Willow River, MN was the next stop, a distance of 50km. Offering no rest for the weary, the next stop was Pine City, MN, 63km down Highway 61. By the time all skiers reached Pine City, the field was down to 10 skiers and Pete Fosseide had an expanded lead. Fosseide attributed his fast skis to his homemade potion of bee's wax, pine tar, and paraffin. Looking at the photo above, Pete used Rottafella bindings on his ridge-top skis. Monday's 56km trek to Wyoming, MN brought the group of 10 skiers closer to St. Paul. As the skiers got closer to St. Paul, the snow conditions changed and in some areas the snow was scarce. Skiers had to hunt for roadways and snow-covered yards to avoid damaging their skis. The final leg of 46km from Wyoming to St. Paul finished at the St. Paul Auditorium. When Fosseide reached the auditorium, he was greeted by the cheers of St. Paul Winter Carnival spectators and carnival royalty. Fosseide took first place and during the five days, he skied for 28 hours, 44 minutes. Fosseide finished 1 hour and 17 minutes ahead of second-place finisher Hilding Swenson of Duluth. After the competition, the 10 skiers were treated like royalty at parties and dances at the winter carnival. Fosseide still had time to compete in ski jumping competitions for the winter carnival before returning to Duluth. George Hovland admired Pete Fosseide, sharing ski outings with him on occassion. According to a story written in the St. Paul Pioneer Press, Fosseide lived alone and was in remarkably good health. "Skiing and his love of the outdoors kept him young, hale and hardy" said George. Sometimes Hovland would call and ask Peter to come skiing, and he would say, "Not today. I'm a busy guy. I have to go to the bank or to the store or whatever". The Pioneer Press adds: "In his younger days, Fosseide was a talented cross country skier, ski jumper and downhill skier. Four times he won the four-event championship (cross country, jumping, downhill and slalom) in what is now Thunder Bay, Ontario. He also was national champion in 1940 in cross country and Nordic combined (cross country and jumping). 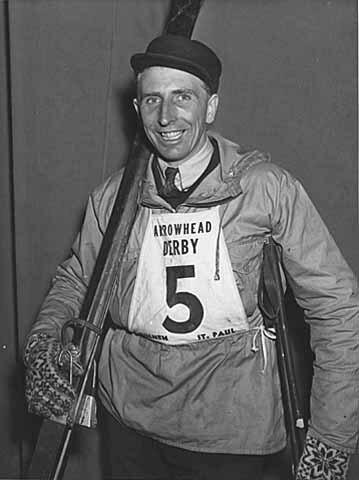 And in 1948, at the age of 42, he finished second in the Nordic combined national championships. 'I was 21 years old then, and I finished third,' Hovland said of the latter competition. 'Peter was a phenomenal skier.' Ski trails near the College of St. Scholastica are named for Fosseide and his good friend, the late Eric Judeen, who are considered the pioneers of cross country skiing in Duluth. " Fosseide died on 10 Aug 1999, 2 1/2 years after the article was written in the St. Paul Pioneer Press. George Hovland promotes and participates in the annual Wooden Ski Rendezvous held at Snowflake Nordic Center in Duluth. Sources: Photo from Minnesota Historical Society, story information from St. Paul Pioneer Press, personal information from George Hovland interview.